Fiat hopes the 500's cute styling will help sales of the EV version of the car, shown. DETROIT (Bloomberg) -- Fiat CEO Sergio Marchionne is no champion of electric vehicles. So even if he must produce one to appease California regulators, he won't mess with an Italian icon. After returning to the U.S. with its 500 minicar in 2010, Fiat is unveiling an electric version at the Los Angeles auto show today. 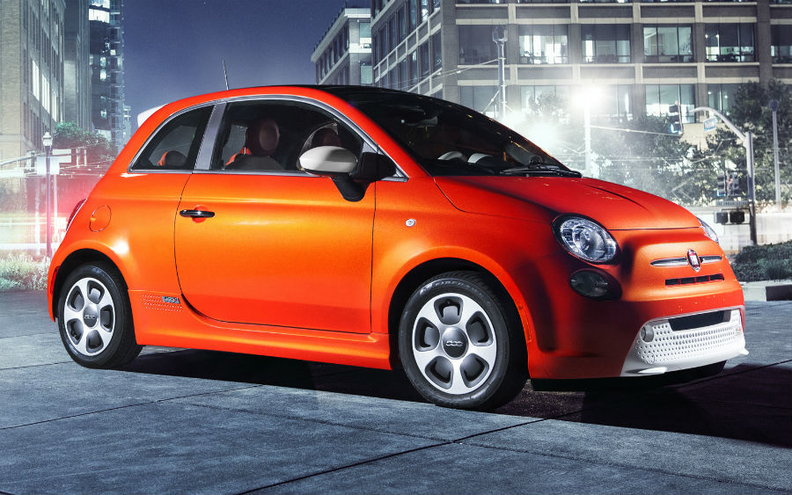 Chrysler Group, majority owned by Fiat, will begin selling the battery-powered 500e next year. Fiat is betting the car will benefit by staying close to the styling of the gasoline-powered 500. That represents a departure from the strategy of Nissan Motor Co., which has struggled to draw buyers to its unconventionally styled Leaf electric car. "Let's be honest, ugliness is probably one of the worst forms of pollution," Matt Davis, head of Fiat brand product marketing, told reporters this month during a briefing at Chrysler's U.S. headquarters. "The Fiat 500e proves that you do not have to give up on good looks to deliver an electric car." The 500e joins General Motors Co.'s Chevrolet Spark EV and BMW's i concept coupe among electric car debuts at the Los Angeles show. California, which has accounted for more than 11 percent of U.S. auto sales this year, requires the biggest automakers to sell increasing numbers of what it calls zero-emission vehicles. Marchionne, 60, has said natural gas and diesel engines and more efficient conventional powertrains are better options for creating greener cars than plug-in hybrids or electrics. While the company hasn't set a price for the 500e, Marchionne in October said Fiat will lose about $14,000 on each one it sells. So far, Nissan and other manufacturers of electrics have struggled to line up buyers. Deliveries of Nissan's Leaf fell 16 percent to 6,791 this year through October, according to Autodata Corp. The Japanese automaker won't reach this year's sales target of 20,000, CEO Carlos Ghosn told Bloomberg Television this month. "For first movers into a certain segment, history will say whether they were brilliant or idiots," said Larry Dominique, president of auto consulting firm ALG Inc. and the former head of product planning for Nissan. "Near term, it could look like they made a bad bet. Long term, it may pan out." Critics of electric cars, Marchionne among them, have said battery costs and range may limit demand for electric cars. Fiat is positioning the 500e as the battery-powered option for buyers who have snubbed Nissan's Leaf for a reason many cars fail to find a market: its looks. Exterior styling is the biggest issue keeping consumers from buying the Leaf, according to a survey of more than 24,000 new-car buyers by J.D. Power & Associates. While styling was also a concern about GM's plug-in hybrid Chevy Volt and Toyota Motor Corp.'s Prius, purchase price and performance were more commonly cited problems among those who passed over those cars, J.D. Power said. "If people can't past the exterior, it doesn't matter what else you have to offer," said Dominique. Before he left Nissan, Dominique said, his team "fought pretty hard" to make the Leaf "at least directionally mainstream." Ghosn's original design, he said, "was much, much more futuristic." Some of the Leaf's "distinctive" components, such as its headlamps, serve functional purposes including increased aerodynamics and reduced wind noise, Brian Brockman, a Nissan spokesman, said in an e-mailed statement. "We heard from our target customers that they wanted a car that is instantly identifiable as an electric car, and the design of Leaf sets it apart from other vehicles on the road," he said. The 500, an update of the 1950s original featured in the film "La Dolce Vita," arrived in European showrooms in 2007 and U.S. dealerships last year. To make the 500e more aerodynamic, designers added mirror caps, side sills, and a spoiler mounted on the rear liftgate that extends the roofline. Airflow inlets were added to the front to cool the battery. The company says the exterior changes add the equivalent of about 8 kilometers (5 miles) of range compared with a simple electric version of the base car design. Fiat says the car will get the equivalent of roughly 2.02 liters/100km (116 mpg U.S./139.31 mpg UK), though those figures haven't yet been certified by the U.S. Environmental Protection Agency. The 500e will go from zero to 100 kph (62 miles per hour) in about 9 seconds, according to Fiat, based in Turin, Italy. Gasoline- powered 500s take between 7 and 11 seconds to reach that speed. "We're not going to sell it as 'Here's an electric offering,'" Tim Kuniskis, head of the Fiat brand for North America, told reporters this month. "It's going to be, here's a Fiat 500 that also has a great electric powertrain." Fiat will introduce the 500e in phases beginning with California. In spite of the losses the company maintains it will suffer for each one it sells, Fiat said production won't be capped at the level required to comply with regulations in California and other states adopting its mandates. "We'll build every one that there's demand for," said Davis, the Fiat marketing executive. "We want to make this a mainstream approach." While the Leaf has been disappointing for Nissan, automakers have also struggled in adapting existing models with hybrid or electric powertrains. GM no longer builds hybrid versions of its sport-utility vehicles after sales trailed expectations, and Ford Motor Co. has sold a limited number of Lincoln MKZ hybrids even after pricing it the same as the gasoline-only version. Ford hasn't broken out sales figures for the electric version of its Focus compact, which it introduced late last year. "As soon as you put an alternative powertrain into an existing vehicle, it draws comparison on a pure economic point of view," ALG's Dominique said. Customers may ask whether it's worth paying the extra money and "'what's my benefit?'" he said. "The whole industry used to joke that the payback on most hybrids was 'Never.'"